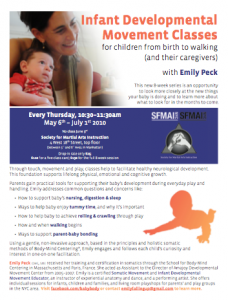 This new 8-week series is an opportunity to look more closely at the new things your baby is doing and to learn more about what to look for in the months to come. Through touch, movement and play, classes help to facilitate healthy neurological development. This foundation supports lifelong physical, emotional and cognitive growth. This entry was posted in Community Classes. Bookmark the permalink. Learn more about IDME's benefits. Amajoy Developmental Movement and Bodywork in Western Mass. Great charts and booklets available.